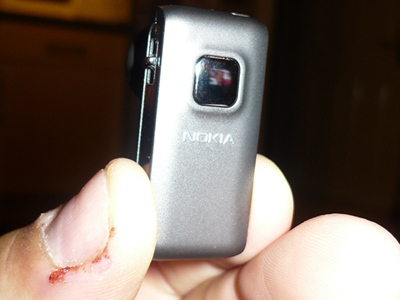 A big fan and long-time user of the Nokia BH-700 Bluetooth Headset, I was excited to get my hands on the Nokia BH-800 and put it to the test. A high-end headset (MSRP: $179.95, ShopCrackBerry: $89.95) with one of the best battery life’s around, the BH-800 weighs in at only 9g, which is light enough for Nokia to claim the use of the included ear loop to be “optional”. Looking at the specs of the BH-800, it’s clear the Finnish company has created a strong competitor to some of the other leading headsets on the market and from previous experience with Nokia Bluetooth headsets I know their claims aren’t hyped. The black (more like 'Coffee') colored headset certainly attracts the eye to its sleek and very fashionable design. The square look is very back to basics but you know immediately it’s going to do everything and more. After opening the lid of the box, and being slowly teased and being made to peel off layer upon layer of packaging, you finally arrive to the tiny headset. 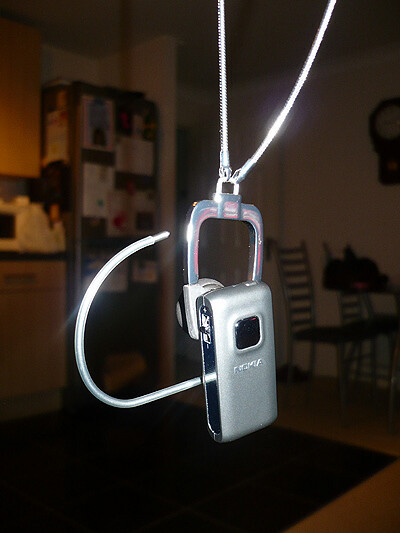 You reach the velvet bag, (I assume this is to carry the headset in), the charger, an ear loop and what seems to be some sort of attachment to hang around your neck (which I will go into detail later on). Nokia seem to have taken great thought into making this headset really look the part. And you can’t help but wonder whether this headset really can live up to the hype that surrounds it. It certainly looks like it’s been well made. 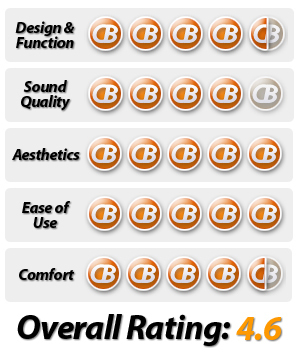 Having been a user of the BH-700 , I certainly have high expectations, and it’s obvious I am not going to be let down. Looking along the edges of the joins, its clear this casing is clipped together rather than glued and the buttons both on the front and top sit and click, as they should. Having charged the new BH-800, I am now ready to link up my Curve. 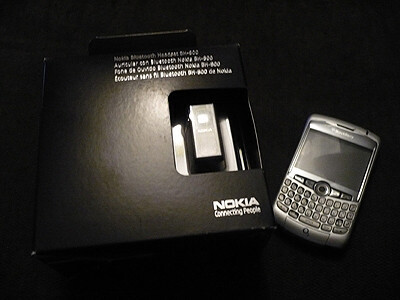 As any Nokia headset, a lengthy push and hold of the power button sends the headset into pairing mode and the pairing code remains as (0000). Within seconds, I am up and running, and the blue LED (next to the power button) is furiously flashing away. 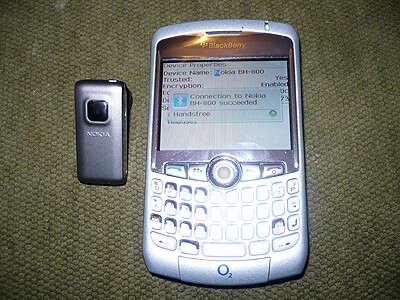 Editing the device properties on the Blackberry is very easy and having had great success with my BH-700, I have made sure I have the same settings. Using the BH-800 is quite easy once you take a few minutes to get acquainted with it. 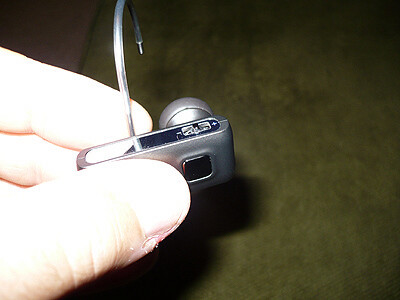 Just before the ear bud that sits at the entrance of the ear canal, there is a little hole to fit the ear loop. On other models this is made of plastic, however on this model, the loop is made of metal. I actually think this makes it harder to fit because on the unit I tested the metal seems to bend quite easily (perhaps this may differ on each unit), but looks wise, in my opinion the metal loop also takes away some of the beauty of the BH-800. Once you have got past this stage, the headset actually sits really comfortably. One of the features that I really like about the Nokia BH Series is that the ear bud sits at the entrance of the ear canal, rather than some other manufacturers that either decides they are going to invade your ear or not sit against it enough so that you can’t hear anything. The fact that this unit weighs in at a mere 9g, you almost forget you are wearing it. 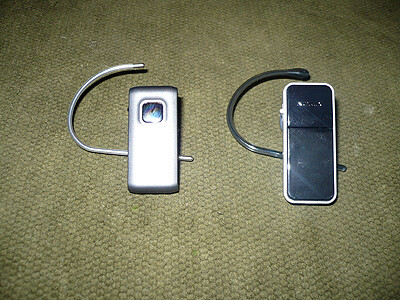 I should add here however that one of Nokia’s claims is that this headset can be worn without the loop, and whilst I would never feel comfortable doing this out of habit, I did test the headset without the loop. 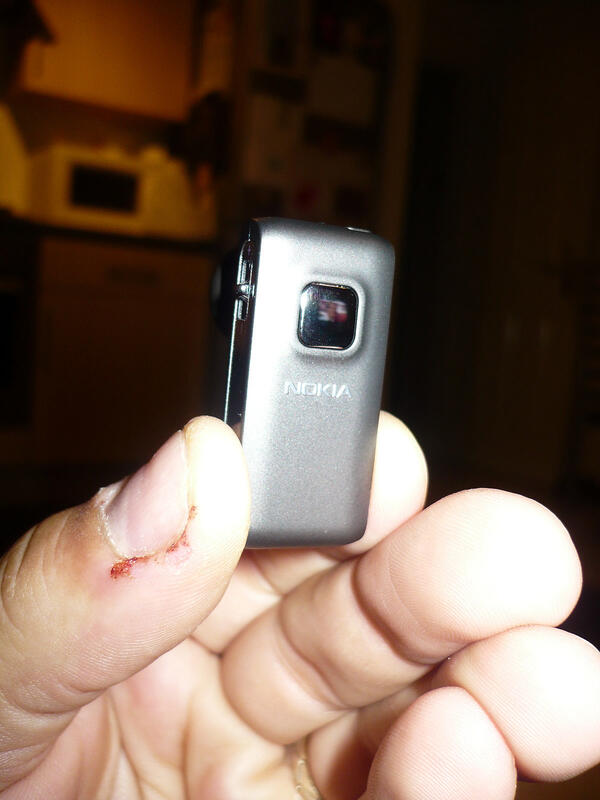 Nokia’s certainly haven’t misled anyone. The headset happily would sit in your ear whilst you would be sitting or driving, but with more rigorous exercise, I feel that it might fall out far too easily and I would spend most of time worrying about it. Maybe it’s just the way my ears are? But I will say that this certainly wasn’t an awkward way of wearing the headset and people should consider this if they are considering purchase as this is meant to be one of the main selling points. Going Loopless! Almost seems like something is missing? Taking calls on the headset, I am able to press the large (I say large, but I mean the biggest button on the unit) silver button and as most headsets, it takes a second or two to kick in. 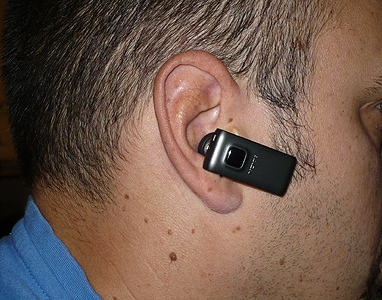 The sound quality of hearing the person on the other end is excellent and there is very little to no background noise. I am told that I could be heard well too and from my previous knowledge, I was expecting this – so this is a good sign. There was initially no echo or “whooshing” noise and often on cheaper headset this is one of the drawbacks - after all, this is a high-end market unit. I didn’t test the headset many times outside, but I know that any wind is easily picked up and this can cause people to hear everything around the caller but the caller. But I don’t think this is any better or worse than any other headset. However this brings me onto the battery life. 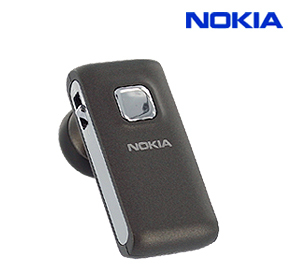 As standard, Nokia products are well known for having very good battery life, and this headset is no different. The battery, an 80 mAh Lithium Polymer cell, takes a quick 2 hour charge and is going to give me up to a decent standby time of a massive 160 hrs and a potential 6hrs talk time. However, I did notice that as the battery got lower there was a very slight decrease in the call quality in similar environments and so it is more realistic to expect 4 hrs of talk time. 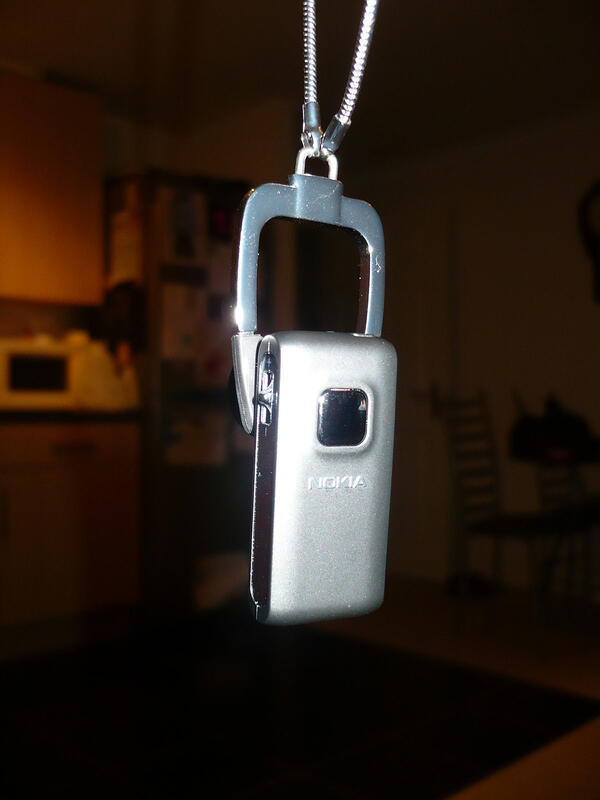 The standard “10m rule” for the Bluetooth remained, but much past this would cause some static on the line, but if you were to stay in sight of your Blackberry then I am sure this could be extended. 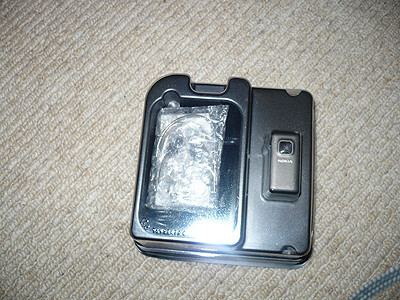 After all this product has Bluetooth 2.0 with EDR and should be very stable. 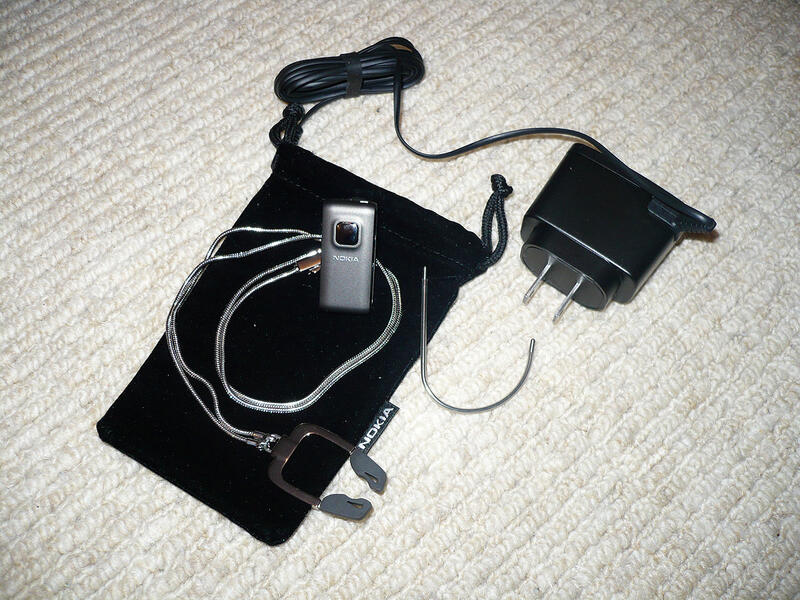 The actual functioning of this headset is pretty standard to any other headset, there are very few buttons and on this unit the power button is situated on the end and is not too hard to find and push, and once you are used to using the headset you become accustomed to its position whilst sitting in the ear. The volume button is not so much of a button but more as a rocker switch. Imagine the track wheel from our old favourites such as the 7290/8700 and now imagine the track wheel as spring loaded. When on a call you can easily switch the volume up or down, and know that you are doing so by hearing the beeping sound in your ear. And it’s fair to say the volume has never been an issue. But the ease of use for this function is a great little feature. This button can also be pressed downward for a few seconds to mute/un-mute a call. The main Silver button on the headset is your Answer/End call button and considering the size of the headset, you wouldn’t want this button any smaller. 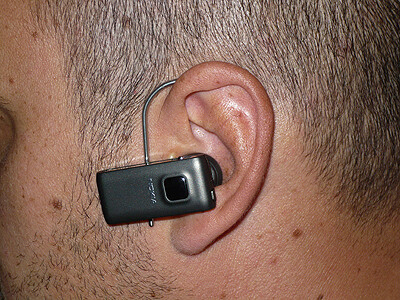 Nokia have made this headset so sleek, you do need to feel for the button a little. The Answer/End call button can also conveniently be used to transfer the call between headset and phone, but I have to say this feature is more easily done through the phone, and in my eyes, could possibly defeat the object of having a headset. Lastly I want to mention the main accessory that comes with the BH-800. Even though I am not normally negative, I want to warn anyone with long hair or in fact any hair on the neck that you may find the silver snake chain an irritation. Although this chain would allow you to carry your headset wherever you go, it forever rubs on the nape your neck and causes some discomfort. But more to the actual function whereby the idea behind it is very good, you have to feel very confident that the headset will not fall off. 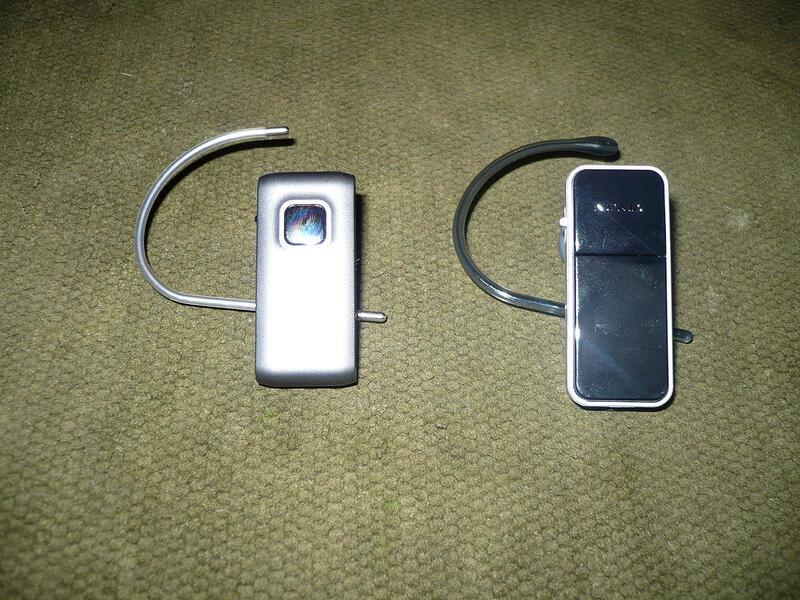 I also found it very hard to actually clip in the headset in the chain when the ear loop was attached. 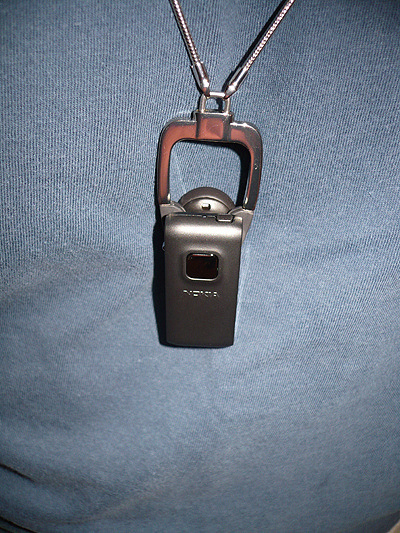 So using this chain would in effect make you not have the previously mentioned ear hook in place, but would allow the headset to be used as Nokia intended. Wearing the Included Chain - Watch the Neck Hairs! It’s an easy decision however to realise that this may have no bearing on the actual quality or main use of the headset. I remember getting a pouch with my BH-700 and I don’t think I have ever used that more than to carry some coins for my daughter. I really was very excited to know I was going to be receiving this headset, and having had the time to play with it, incorporate it into my day, and let it replace my BH-700, I do think this headset will rival any that is out there on the market. 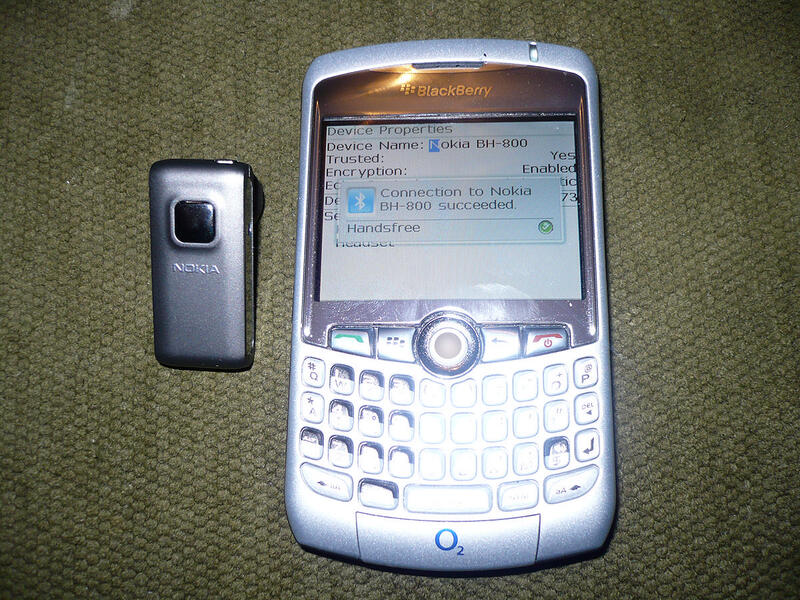 The Nokia BH-800 on the left. My trusty old Nokia BH-700 on the right. I'm still a huge fan of my BH-700, but the BH-800 is definitely a worthy successor. The headset is everything that it is set out to be – it’s small, well made, has long battery life with a quick charge and its stable technology makes it work. Neck (Snake) Chain - ouch on the neck hairs!